– Comes with 32 sheets, and sized 105mm*183mm. – 80g, exquisite artwork on your palm, easily put on your bag. – Elegant textured cover with rounded paper corner, recording your good mood. – Tough firm line binding, lay-flat 180°large ruled note book, enjoy your writing by hand. 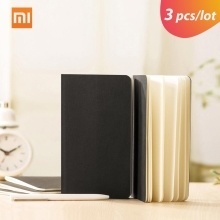 – Perfect for journals, to-do-lists, shopping lists, planning and general notes for home or travel. 1. Item color may show slight aberration due to different shooting light and monitor display. 2. The items on the picture are mot included.